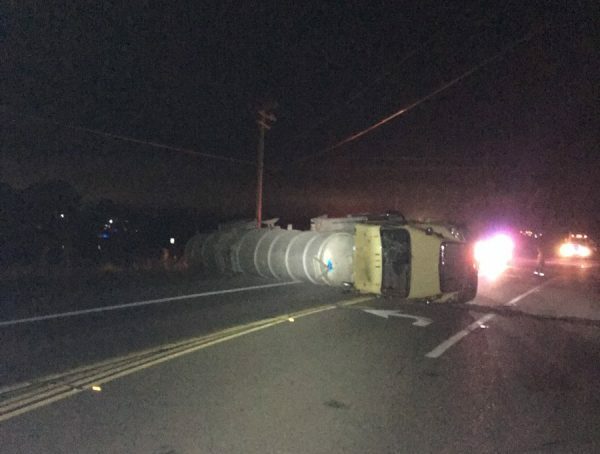 The truck overturned at about 10 p.m. and landed on its side blocking the highway by Solomon Road slightly west of Orcutt. One minor injury occurred as a result of the crash, according the Santa Barbara County Fire Department. Another vehicle was reportedly involved in the accident, though the details are unclear. Officials did not report any oil spilling as a result of the crash. Authorities closed Highway 1 in both directions for several hours. Sunday’s crash occurred less than a month after an oil tanker overturned near Highway 1 on the Nipomo Mesa, prompting the evacuations of homes.